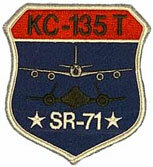 The KC-135Q/T Stratotanker was the unsung hero of the blackbird program. Without refueling, a blackbird had a maximum operational range of about 3000 miles. Some missions were flown from Kadena AFB with only the fuel on board, but those were the exceptions. Most missions required at least one and sometimes as many as six aerial refuelings, depending on the mission profile. 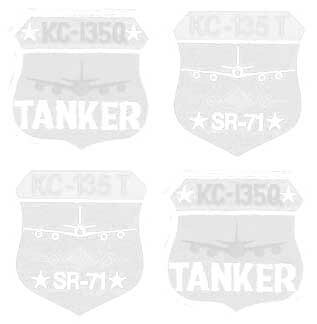 Of the 803 units produced between 1954 and 1965, 56 of the KC-135's were converted to Q (and later to T) specifications. The one major different between a Q/T tanker and a standard KC-135, is that the payload fuel in the body of the aircraft is isolated from the KC-135's own fuel load in the wings. This is necessary because while almost all aircraft in the USAF inventory use JP-4 jet fuel, the blackbirds used JP-7. JP-7 has several unique properties that make it perfect for use in a plane that flies at over 2,000 miles per hour, at an altitude of 17 miles and a skin temperature between 400 and 1200 degrees Fahrenheit. Fuel from the tanker is pumped on to the blackbird at a temperature of about -60 degrees Fahrenheit (the fuel is not refrigerated; this is the ambient outside temperature at the KC-135's speed and altitude). Once it is taken on board, the cold fuel is used as a heat sink to cool the blackbird; fuel is circulated throughtout the aircraft to help keep its temperature under control. Only the hottest fuel is pumped into the engines and afterburners. By the time it reaches the blackbird's engines, the temperature of the JP-7 fuel is over 400 degrees Fahrenheit. JP-4 would self-combust long before it got there. The other important reason to keep the fuels separated is that JP-7 is very difficult to burn. The same high flash point that keeps it from exploding in the tanks, also makes it hard to ignite. The blackbirds carry canisters of a highly volatile chemical called Tri-Ethyl Borane (TEB). When exposed to oxygen, TEB will self-combust at a temperature of over 2000 degrees Fahrenheit. This flash is hot enough to ignite the fuel and send the blackbird on its way. 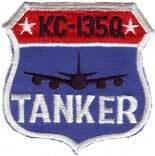 The KC-135 tankers do not carry TEB, and cannot burn pure JP-7. Tanker operators have reported that, should circumstances require it, they could burn the JP-7 if they mixed it with their own fuel. The main difference between the KC-135Q and the KC-135T is the CFM-56 engine upgrade. Other improvements included a new electrical generator system, strengthened main landing gear and anti-skid brakes. The Other Tankers Contrary to popular belief, the KC-135Q (and later T) was not the only aircraft that could refuel the blackbird. Three KC-135s that were never modified to Q/T specs were used on occasion to refuel the blackbird. At least five KC-10A aircraft were also used, and Boeing once modified the prototype 747 as a proof of concept for using it as a tanker aircraft. The USAF passed on the concept, and only four of the KC-33A tankers were ever sold (all went to the same foreign government).